Report by Cairde na hEireann into Far-Right and Loyalist Attacks in Liverpool. Interesting article from the Irish Anarchist History Archive. 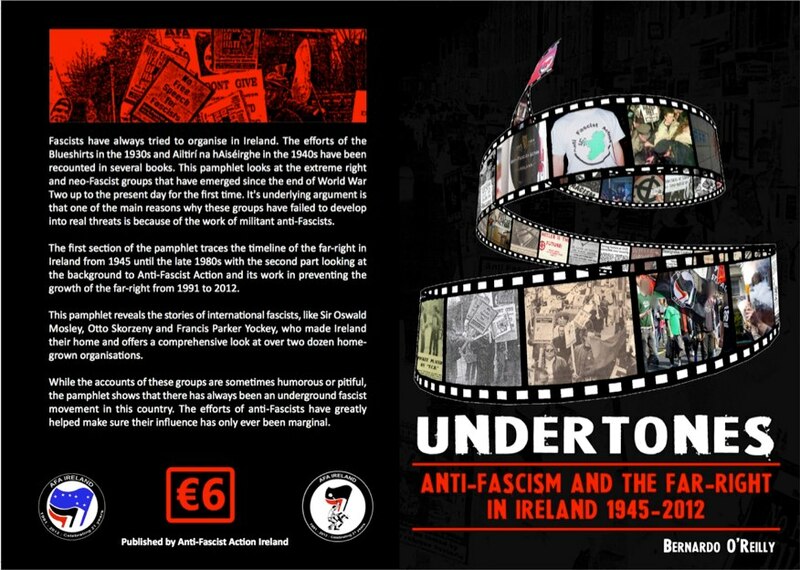 Anti-Fascist Action Ireland, related to AFA which existed in Britain, celebrated its 21st Birthday last weekend with a number of events including the launch of its pamphlet Undertones: Anti-Fascism and the Far-Right in Ireland 1945-2012. The 100 page pamphlet has been well produced, the cover, design and colour images are excellent. Brunch Crew in Berlin help with the publishing by hosting a benefit gig in February 2012. O’Reilly, AFA Ireland and everyone who helped in the production should be proud. The pamphlet is split into two sections: firstly, a chronological history of fascism in Ireland from 1945 to the late 90s and the second section details the origins and history of AFA Ireland through stories of events and actions. Another good aspect to the book is that O’Reilly has fully referenced all his research and claims. This first section gives a fantastically detailed and researched history, with names, dates and addresses; yet it is easy to read and follow the chronology of the faces and groups on the far-right in Ireland. It begins with Ailtiri na hAiseirghe in the 1940s and flows through to the National Socialist Irish Workers Party in the 1970s and the Irish fascist links to groups in the North of Ireland in the 90s. It is in this section that O’Reilly argues that it was an IRA unit who burnt down Oswald Mosley‘s County Galway mansion in an unsanctioned operation; in previous literature it has been described as an accident (p. 7). 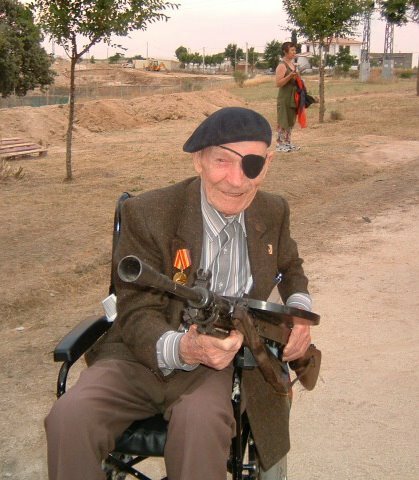 Its not solely Irish fascists who are detailed but also their international connections to British fascists, Mosley; American, George Lincoln Rockwell; German, Otto Strasser; plus more. After reading the section Ireland is painted as Europe’s “Argentina”. 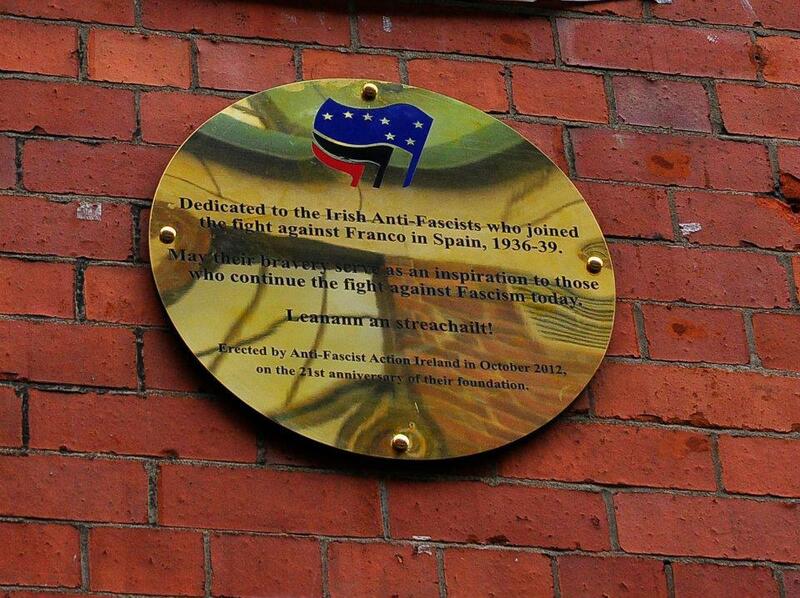 The second section begins with the origins of AFA Ireland and ends with their most recent activity. It describes the politicisation of the young punks who would later become the founding members through Nazi stickering and a strike a the Dunnes Stores, Dublin. The section then progresses through 25 stories of activity against the likes of David Irving, Le Pen, Immigration Control Platform, Czech neo-Nazis and anti-drugs activity. I highly recommend buying the book. A steal at €6! Visit the AFA Ireland site and send them an email. 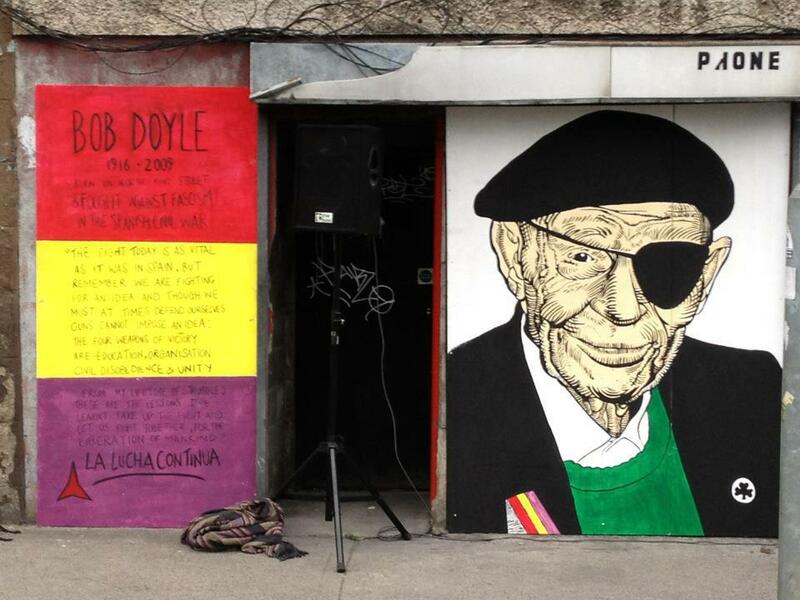 A mural to local man Bob Doyle, IRA volunteer and International Brigader, was unveiled outside The Cobblestone in Smithfield, Dublin as part of the event too. This post will list various literature from Red Action. Red Action reply to the Irish Republican Socialist Party regarding the Hands off Ireland and its march.